For over 100 years, the Manhattan flower district has been located mostly on West 28th Street between Seventh Avenue and Broadway. Here the experience of buying flowers can be awe inspiring and overwhelming with shops spilling over a limitless array of product onto sidewalks. Roses, chrysanthemums, magnolias, branches – all the sugary smells mingle with the exhaust from double-parked trucks and sweaty workers rushing to fill orders and load trucks before being ticketed. At 5 a.m. florists show up to lock in the freshest and best but after 8 a.m. those without a license are allowed to shop. Not to worry because the supply is plentiful for those who do not wish to rise at the crack of dawn or are more of the “garden club” type’s like me. Flowers are delivered early Wednesday’s and Saturday’s to the wholesalers therefore choices are greater on those days. Also, prices are never listed, so you should work together with one of the workers to find an item cost before making a final decision. Fortunately, you are able to place flowers on a shelf and organize while shopping. When over and done, you will be given a hand-written itemization, your flowers will be wrapped, and you will be on your way to construct an arrangement with your own signature! -figure out your color scheme, amount you have to spend, number of arrangements etc. ahead of time because it is very easy to become distracted. -check for freshness! 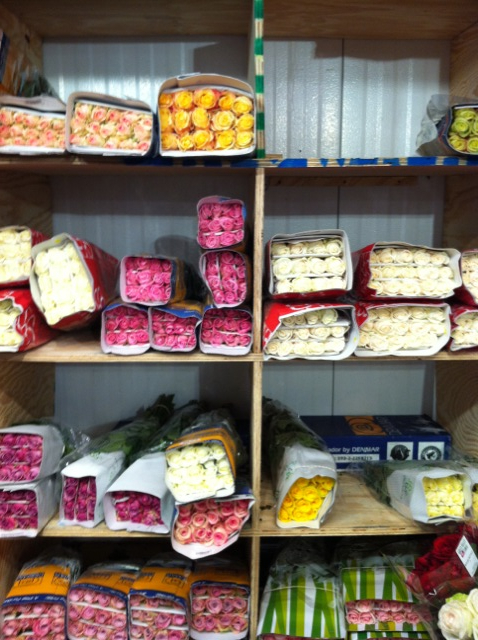 Roses for instance are packed tightly into corrugated boxes and it is easy to be tricked –Look at the rose’s calyx or petals in the center of the rose. 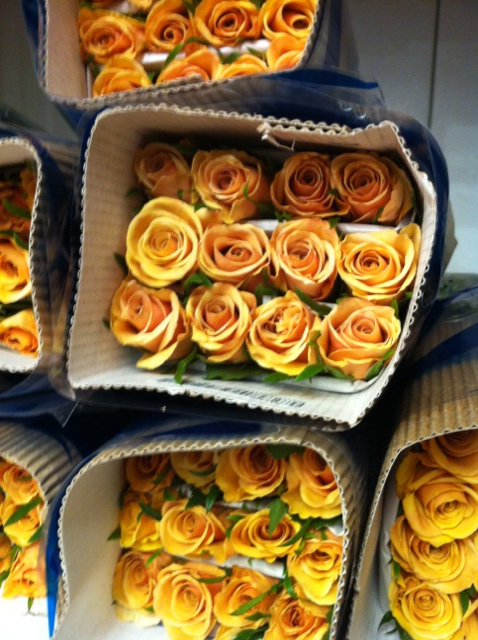 Fresh roses have tight center petals that are not browning. 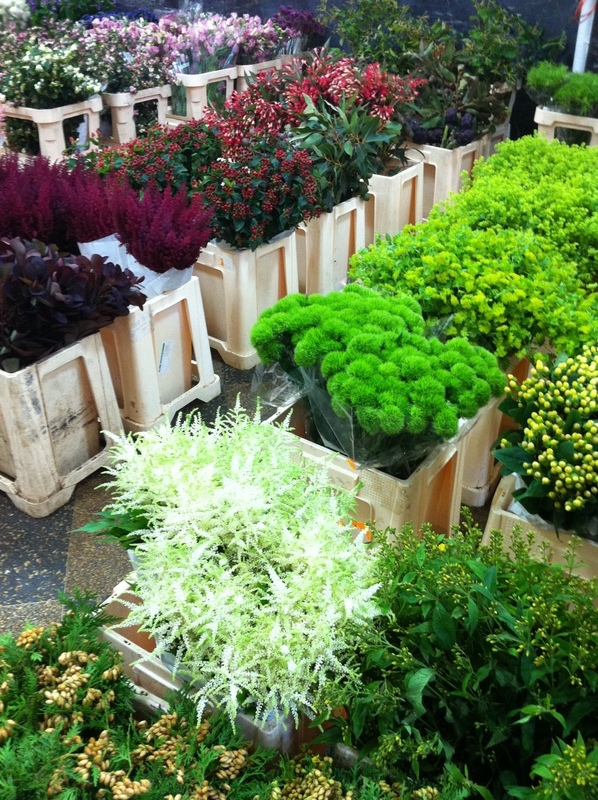 Flowers and greens ready for the picking… some plants are sold out by 11am. 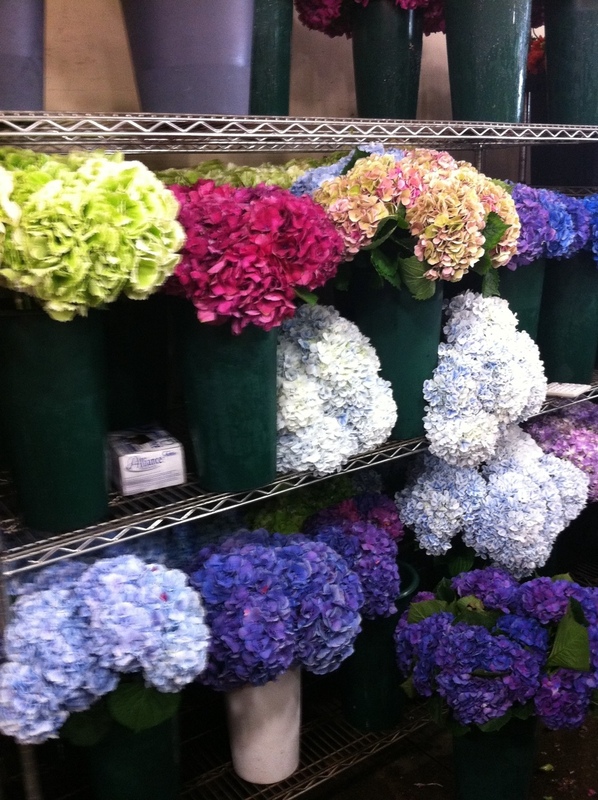 Hydrangeas in more colors than you thought possible! Some time ago, this pink and cream ‘paint splashed’ looking rose in the upper left corner started out as one affected by a ground disease… but vendors decided to see if they’d sell. They did – and now they’re a staple among the roses! 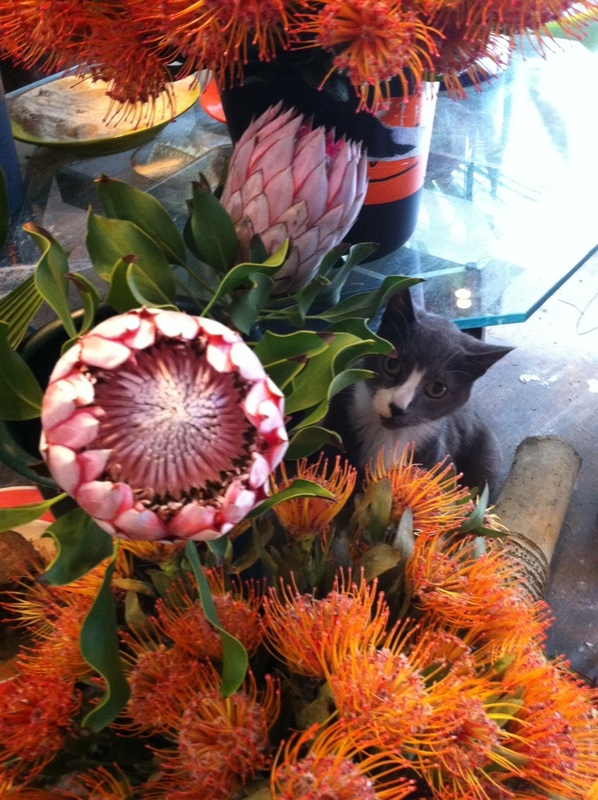 The flower market is always full of surprises… today, this cat down below was one of them – lurking among the tropicals.